Beautiful apartment and quality repair, withtasteful modern furniture and comfortable interior - the dream of every man. But that's just all this splendor pales in rooms with uneven walls. Very often, people try to hide a small dam and close it with furniture or resort to other tricks. In vain, because it is necessary to level uneven walls, not masked. For example, the furniture only emphasizes the disadvantage. 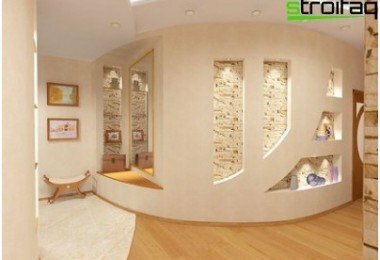 Therefore, this article focuses on how to align the walls and achieve the desired result. The better align the wall? How to remove a significant irregularities? Causes of uneven walls may be different. Ceilings and walls in older homes often leave much to be desired, but they are not ideal in many buildings. Most of the panel houses have walls curves due to the fact that a little uneven bar stood. But not to such an extent that the house can not be put into operation - its reliability, this aspect is not reflected. When installing the stove itself could barely turn around. For a more visual representation of the situation need to find landscape piece of paper and put it on the table. Leaf is smooth, but if you take it at the ends diagonally, then pull up one end and the other down, one can observe an interesting picture. What happens to a leaf? This is the same principle can bend and concrete slab. This deviation is small, but it is enough for the dam walls and corners of the geometry violations in the room. It is possible to align the walls with his own hands, butFirst we need to determine where there is a blockage. 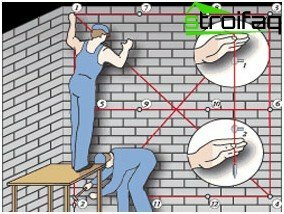 To do this, pay attention to corners, if there is an assumption that some kind of wall is uneven, you need to check the correctness of his thoughts. This is done in an elementary way: one end of a thin but strong rope tied a heavy object, and the opposite end must be applied to the corner engages the upper floors and walls. Well, walls and rope line parallel? So the walls are smooth, and if abnormalities are observed, that is, there is a blockage, and it needs to be eliminated. Important: it is desirable to carry out such a test together - one person holds the string, and the second from a distance of several meters evaluates the parallel lines. There is another option for the assessment ofsurfaces. This process will also need a homemade plumb with a small weight, which does not rotate. In every corner you need to perform a so-called staking. For this purpose a plumb cord is attached to a nail driven into the wall. Important: The nail is hammered near the ceiling, so as to plummet located near the wall, but do not touch its surface. Next, you need to move the plumb line on the nail to determine its optimal position, then at the bottom of the wall is hammered another nail to touch the cap thread plumb. Such an operation is necessary to conduct and the other edge of the wall. The next stage - stretching cords majachnym on four points, eventually you can get an accurate picture of the state of the surface of the wall. With a small deviation of 10 mm in the repairYou will need to carry out plastering work using gypsum and cement mixtures for leveling. And will have to resort at a significant vertical deviation to leveling plasterboard walls. How to properly align the wall, that is whatpriority should be followed? First the surface preparation: it is important and the lack of a solid foundation crumbling areas. 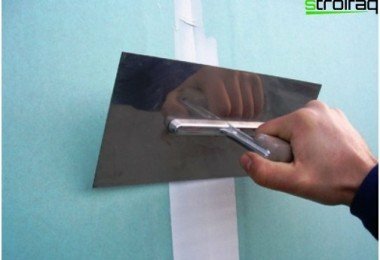 It is also necessary to remove the remnants of old wallpaper and shabby plaster. 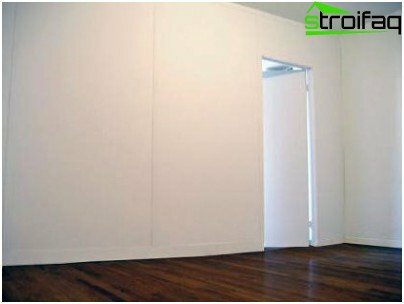 Next, carefully prepared wall is primed by brush, roller or spray. Primed substrate must dry for about 12 hours, so this work is best done closer to the night, so as not to waste time waiting. 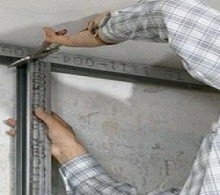 Depending on the materials used, there are 2method for aligning wall curvature. The first crude (using construction mixtures), and the second - dry (construction structures). Both ways are good, but only if strict compliance with all processes. And each has its own characteristics, advantages and disadvantages. Generally, plaster alignment finds its application in small drops (30-50 mm). Of course, it is possible to use them for surfaces with greater curvature. But additional financial costs, and to work, and materials. So better option in such cases - the frame assembly and trim its plasterboard. So, if irregularities have already been identified, and the surface of the walls are prepared, you can actually begin to equalize. Important: do not forget about electricity - must first disable it. And while cleaning the walls to act carefully so as not to damage the wiring elements, which is hidden in the wall. For durable fixing plaster wallsnecessarily be primed. This process prevents delamination extremely undesirable materials, and also increases the moisture resistance performance. For cement mixtures used laitance, consisting of cement, sand and water. When the wet plaster best alignmentapply the "beacons" technology. This special metallic element, made from flexible aluminum. Lighthouse build in the wall in a curve, it is for him, and is followed by alignment. For greater clarity, you can give an example: if the wall is filled up at the top, we can understand that the lighthouse is necessary to rest at the wall bottom and the top between the wall and the beacon will be placed some material, for example, rotbant - and it eliminates unevenness. Installing the beacon begins with mounting railsprofiles on opposite walls. The verticality of each beacon checked plumb, and on the wall profiles are mounted plaster. On rail plaster is applied at several points with a distance of 50 cm. Then through the lower, middle and upper sections stretched cord. The following slats are also mounted on the wall, but so that they barely touch the cord. Important: the distance between the beacons is chosen based on the size of the tool, which will be applied plaster. It is also possible mount beaconsself-tapping screws. It's a bit slow progress, but then it is much easier. Even a layman can easily adjust the verticality of lines by tightening or unscrewing screws. 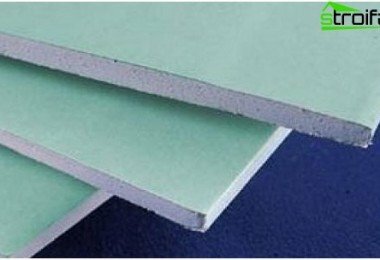 Equalizing structure depends on the maximumthe thickness of the smoothing layer, as well as on the type of binder - cement or gypsum. The cement mixture is best suited for wet rooms (bathroom, kitchen), and plaster structure is desirable to use in living rooms because it perfectly supports the indoor climate. When the lighthouse completed nomination remains the casefor small. Now you need to dilute 10-15 liters of plaster and apply it between beacons. The mixture must have a certain consistence, it should not be too thin (to be sliding), and too thick (hard to be applied). If used in the gypsum composition, the amount thereof should be such that the mixture has been worked out for an hour. After application, it is usually taken the necessarylengths and pressed to the beacons, and then leveled surface movements from bottom to top, or vice versa, as you prefer. If in some places was not enough for the mixture, then it is necessary to add and hold the rule again. These steps are repeated until, until the wall becomes perfectly flat. When superimposed layer of plaster is dry, you will notice the roughness of the walls. For this reason, there is a need for its processing and finishing putty sanding with fine sandpaper. 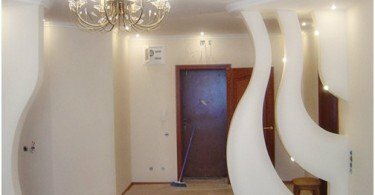 The advantages of this method of alignmentIt lies in the fact that it is not useful floor space is taken, and the shortcomings - need pre-treatment of the walls, and it is quite time-consuming process, after which there is a lot of debris and dust. Separate time alignment process - angles. To align the corners of the walls, because it is the most problematic areas? It is advisable to use this work angle trowel, level and other subsidiary instruments. Align corners - employment laborious and requires experience and knowledge. For faster setting solution in the corners, you need to add to the mix a small amount of gypsum. 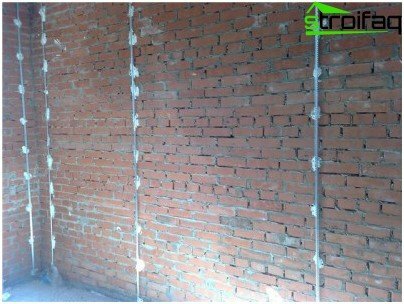 How to align the wall in the apartment with a largeswings and terrible curvature of the walls? In this case, recourse to rational installation of specific structures, followed by lining them with plasterboard. This method has a major drawback - the "eating of" usable area, but is also characterized by a positive side: no need for preliminary work, as well as inside the building frame can be hidden communication and to lay sound and thermal insulation materials. This method has the right to life. First mounted skeleton, which is then sheathed with plasterboard. Align the blockage can be, but still a blockage does not disappear, but simply hidden under the casing. If a small apartment, these machinations will make the living space even smaller. If the repair started in the apartment, then surely the question arises as to align the walls under the wallpaper? 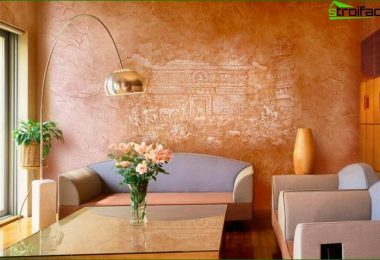 Wallpaper and other decorative coatings require a smooth surface, which is necessary to prepare. If minor irregularities can be safelyhandle normal wall putty. 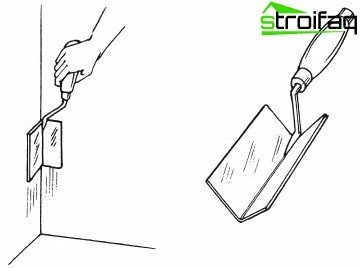 For this purpose it is necessary to take advantage of spatula, which is designed for grouting cracks and subsequent putty. The easiest option - to use two spatulas are medium in size. With a large amount of work can be diluted with putty in the pelvis so as not to jump up and down constantly. And for small holes and slots used a small piece of plate. Important: If the volume is still large, it is best to dilute the mixture, using a drill with a special nozzle. And if the layer is thick, the prethe surface to be processed starting putty. With the right technology putty applied in stages, but only when the previous coat is dry. Typically, three layers are applied, the last - finishing putty for finishing work. Then, the entire surface is cleaned with sandpaper. The most common cause in the lining of the walls of the bathroomroom - view of the future of finishing. If this is the tile, it is necessary to know how to align the walls under the tiles. It should be noted that working with a tile - a responsible and serious process that needs the right approach, and the rough walls are no exception. 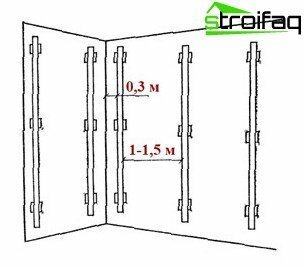 So, before proceeding to the main process, it is necessary to consider how to align the walls in the bathroom, sticking technology. Laying tiles is only possible onsmooth walls, because ignoring this issue the result could be disastrous: bulging masonry mounds and tarnished appearance of the premises. The most common way of leveling - the same beacon. Walls with lighthouses are more durable,because after the completion of the work they are not removed from the wall, and continue to support the plaster. When working with the help of plaster ledges you can get great angles of 90 degrees. The plaster is applied on the principle of "throwing"walls. For this purpose, it is desirable to use a trowel. During the time covered a small area and not the entire surface of the wall. After the mixture is applied, you need to give her time to the drying up, and then you can cut the excess protruding portion of the solution, which go beyond the beacon. By truncating the solution is added water, and again it will be overwritten by the following intervals. After drying, the plaster walls should be primed, and then laid tile. The primer promotes better adhesion of the adhesive to the base solution. Options to align the walls there, knowing allsubtlety and cunning of this time-consuming process, you can achieve a good result. Job Plasterer, masters of their craft, based on a quality surface, consisting of plaster and fine lighthouses. The main thing to strive for something better, and not live"So come down" in principle. No, do not come down, human habitation should be executed properly: with smooth walls, the beautiful decor and matching furniture. Living room with such conditions more comfortable than every day to contemplate the angles and curves of the rubble wall. 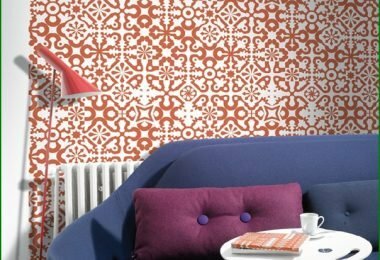 Perfectly smooth walls - the norm to which to strive, since the curvature does not hide any high quality wallpapers or compositionally installed furniture.